In perhaps a questionable parenting move, I let my first-grader watch a video of “All About That Bass” on YouTube. Well, she fell in love with the song and has been watching the video over and over and over. As I’ve now learned the words to the song, I’m a little horrified at the thought of her singing it at school – except, she keeps singing the wrong words! Instead of “all about that bass,” she sings “momma vase” and it makes me laugh. Did you know singing the wrong words to a song is so common there’s a word for it? Mondegreen means a misinterpretation of a phrase leading to a new meaning as a result of it sounding like something else. If we do this so often with song lyrics, what about scripture, creeds, and prayers? Want to deepen your prayer life? Join the 40 Day Lord’s Prayer Challenge today! 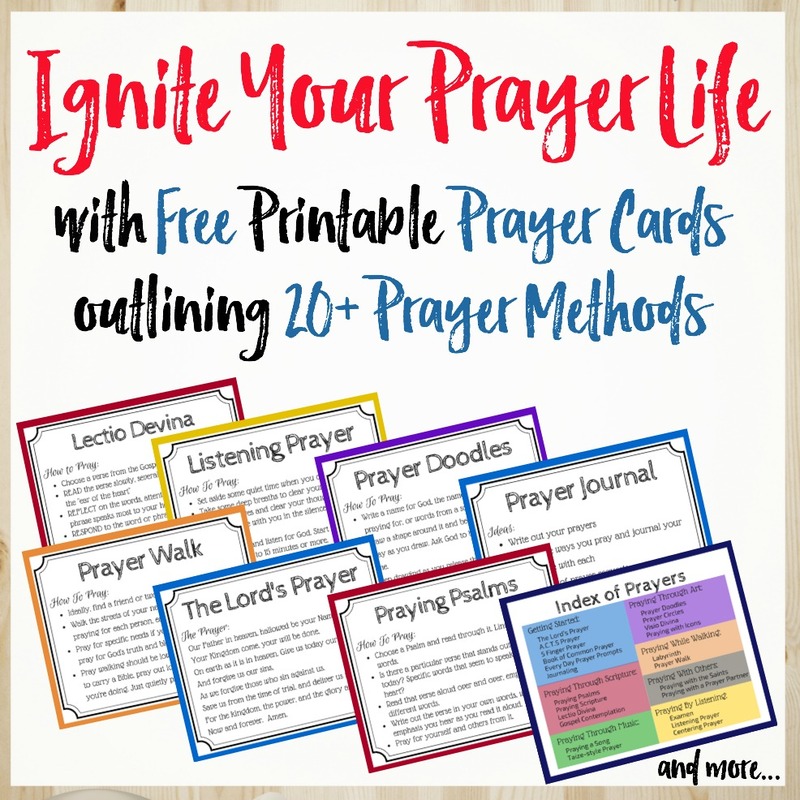 Click here to learn more and download your free prayer calendar and Lord’s Prayer printable. Experience the Lord’s Prayer in fresh ways and enrich your prayer experience. When is the last time you really looked at the words of the Lord’s Prayer? After all, this is the prayer Jesus taught us to pray, but how often do we take the time to truly consider the words and take to heart what we’re praying? Does the Lord’s Prayer sometimes become a series of words we rattle off during church with little thought to what they mean or how they should change our heart? Most of us can probably rattle off this prayer from rote memory. Even my young kids can run through this prayer, but I doubt they really understand the words they’re saying. Are they even saying the right words? What about you? How many times have you said these words in your lifetime, but how often do you stop to really consider what you’re praying and take it to heart? These 52 words so succinctly sum up our prayers and where God wants our hearts as we walk in faith, yet all too often we roll through this prayer without stopping to consider the words. Spend some time with the Lord’s Prayer and let it work into your heart. Try praying it in different ways and let it take root and impact your life. Below are three ways to approach the Lord’s Prayer and dive deep into its words. Take some time today to pray the Lord’s Prayer, but instead of just reciting it quickly, pray it slowly. Read the words so you can focus specifically on what it says. Pause after each phrase and take in what those words mean. What do those words mean to you right now, in your life today? What do you want them to mean? Maybe you get tangled up in the language and words like “daily bread”, “trespasses” or “debts” just don’t resonate with your heart. Rewrite the Lord’s Prayer in your own words. How would you express these same thoughts to God? Take each phrase and write down your version. Take the time to make this prayer even more personal and meaningful. Now pray it again in your own words. Does it sink in a little deeper, feel more powerful, and become more than just words we recite? The A.C.T.S. model for prayer is another way to pray the Lord’s Prayer in your own words. To help the words take root, spend time exploring what they mean for your life today. For each phrase in the prayer, stop and respond to God. Take time to review what those words mean in your life. Where do they challenge you? Where do you struggle to live them out? How do you need God’s help as you seek to live into each? You might want to journal these prayers. See how your responses to the Lord’s Prayer change over time as you seek to dive deep into this prayer and what it means in your life. How do you interact with the Lord’s Prayer? Are there other ways you can take a fresh look at this most ancient of prayers and make it relevant and impactful in your life? These are the words Jesus gave us to pray, so let’s make them more than just something we recite in church. Instead, let’s make them words that guide our lives. Check out the video below where Matt Maher explains the inspiration behind writing “As It Is In Heaven”, which is based on the Lord’s Prayer. Praying the Lord’s Prayer through song is another way you can try to make it fresh and meaningful in your life. I like the idea of putting each of these petitions into my own words. Good idea and helps with understanding the meaning for sure. Blessings on your prayer series. May many people be blessed by your words during Lent. This one is so familiar, I’d stopped thinking about the words I was saying – until I started reading as I said them. Made a difference to start thinking about what the words really mean. Kathryn, once again you have blessed me with your words. It is so true – we can become familiar with the words of The Lord’s Prayer (and other Scriptures) & skim right over them without recognizing their significance. May we take the time to read slowly and absorb the depth of meaning into our hearts & minds. So grateful to be here this morning! Blessings! Thank you, Joanne! Glad these words connected today! Hope you have a wonderful weekend! So true, Kathryn. Thanks for this thoughtful reminder to re-examine what we do, what we say, what we pray. And why. Sabbath blessings to you and your family! Blessings to you, too, Linda! Growing up in a traditional church I always felt like I was on auto pilot during many of the prayers that were said every week during the Sunday service. I pray that the familiar will continue to be made new by looking at it through God’s eyes and not my own. Blessed you joined us at The Weekend Brew. I’ve found that taking a little time to think about the words we say and sing really make a difference. The language of the traditional prayers and hymns are beautiful, poetic, powerful – but we need to do more than just recite them. Praying you’ll find new life in old words! type of thing. It gets real when God starts questioning us about how much we really mean what we are saying…like forgive us as we have forgiven others… Anyway, it really makes you think when you pray it and remember we are talking to God, not just reciting a poem. I bet that skit is great! I was looking for it on YouTube and found another one they have about the Lord’s Prayer that’ll be in post next week. I love knowing this prayer by heart, but it really sinks in when I slow down and read the words and think about what they really mean. I think it’s true for a lot of prayers we say in church – we need to remember that we’re talking to God, not just reciting nice words. This is great Kathryn. We can get in the habit of reciting The Lord’s Prayer without engaging at all. I believe personalizing any of our memorized prayers helps us to stop, think, and really prayer. Blessings! Thanks for linking up at CMB. Thanks, Deb! I love making old words feel fresh and new. I love this post. Thanks for the clear words and puuting this Prayer it into our own words is such a good idea. Taking the time to make the words real to me really changed how I view this prayer. Hope it does for you too!